In this article we will show you, How to write C Program to Calculate Area Of a Rectangle and Perimeter of a Rectangle with example. Before we step into the program, Let see the definitions and formulas behind Perimeter and Area Of a Rectangle. If we know the width and height then, we can calculate the area of a rectangle using below formula. 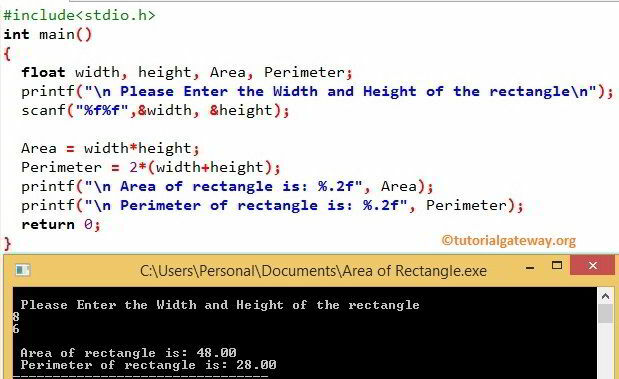 This C Program allows the user to enter width and height of the rectangle. Using those values we will calculate the Area of a rectangle and perimeter of a rectangle. Following statements will allow the User to enter the Width and Height of a rectangle.